Our bags are made of bamboo sticks and leather. This designer handbag is best style statement to look different & elegant in a crowd. It is made from the bamboo mat & rexine with good quality zip by the artisans from north eastern state. - Colours available : Brown, Yellow, Red, Green, Natural colour and many more. - Application: Utility Product Storage. Description:Green conference bag with short handles. Bamboo Bags is an ideal environment bags for summers. These bamboo ladies bags are handcrafted by the community in Manipur known as Meiteis. It is easily available in market and is made out of a reed that grows in marshlands. - Available in different plain colors. 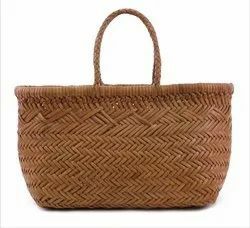 we offer high quality jute bamboo bag. 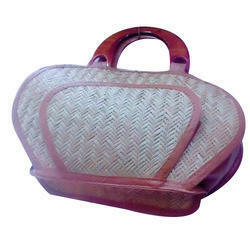 We are offering Bamboo Handicraft Picnic Bag to our clients. Eco-Friendly and Unique Bags made with bamboo to express a touch of Nature. We promise to deliver authentic and best quality products at best prices. The products are perfectly crafted out of finest of materials to ensure long term use. A great accessory for your outings with friends or a busy day at work. Good amount of room for all that you want in it.